Earn up to 10 CME credits: 100 multiple-choice questions. If you have already purchased this self-assessment program, you may log in and begin taking it here. 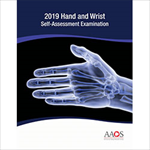 The goal of this examination is to enhance the resident and practicing physician’s ability to diagnose and manage common hand and wrist problems seen in clinical practice. Each question clearly presents a specific case followed by an extensive discussion with up to date references provided. Confidence and ability in recognizing and treating patients with acute and chronic wrist ligament injuries, hand and wrist fractures and dislocations, flexor and extensor tendon injuries, and nerve problems affecting the upper extremity will be markedly improved. • evaluate, diagnose and treat patients with acute and chronic wrist ligament injuries. • interpret radiographic images and make decisions regarding the treatment of fractures of the forearm, wrist and hand. • evaluate, diagnose, and discuss treatment options for idiopathic, traumatic, and compressive nerve conditions involving the upper extremity. • interpret radiographic images and make decisions regarding the treatment of acute and chronic dislocations of the wrist and hand. • diagnose and discuss treatment options for pediatric and adult patients with compartment syndrome affecting the upper extremity. Credits earned by completing this Scored and Recorded Special Interest Self-Assessment Examinations can be applied to the scored and recorded self-assessment requirements as mandated by the ABOS Maintenance of Certification (MOC) process and will count toward the CME credit requirement, as well.